The rumours were true. Canon has crammed the $US1500 50D's sensor and 5D-Mark-II-like 1080p video capture into an $US899 entry-level Rebel. We ran it through its paces for a few hours, and it's awesome. AU: The local announcement came through as well - The 500D (as it's known here) will launch in May, with all RRPs TBC. We'll let you know more when we do. So what we have here is almost the exact sensor from the 50D—a 15.1 megapixel CMOS with sensitivities up to ISO 12,800 at its top-end H2 boost setting. And almost the exact same HD capture from the 5D Mark II—the only change is that 1080p video is captured at 20fps, down from the 5D Mark II's 30fps. 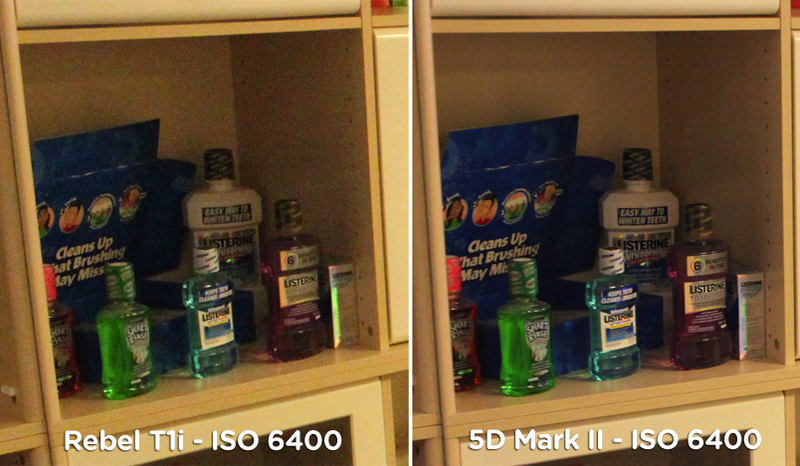 You can step down to 720p video at 30fps, though, for the same buttery smoothness we've seen on the 5D Mark II. Other aspects of the video capture mode have actually been improved over the 5D Mark II though, which we'll get to in a second. I've never shot with the 50D, but from what I've read, the 50D's sensor is about as big as Canon can and should push an APS-C sensor, megapixels wise, while still preserving image quality and high-ISO performance. When it came out just seven months or so ago, it was found to be a good performer but not significantly better than the 10-megapixel 40D at high-ISO. And here's where things get crazy—the T1i's video capture mode is almost exactly the same as the 5D Mark II, short of 10 extra frames per second at 1080p made possible by the 5D's beefier processing power. But still, shooting at 720p will serve most people just fine (and it's as high as you can go on Nikon's D90, keep in mind). You do notice the lower framerate at 1080p, especially if you're panning a shot, but for slow-moving subjects, it's not significantly jerky. Some people may even prefer the ability to switch-up frame rates. But aside from that, everything else from the 5D Mark II is there: the ability to capture stills while video is rolling, the same slow AF system, etc. In fact, the T1i actually makes some improvements over the Mark II—a quick menu summoned via the SET button can change resolution and video settings easily while you're shooting, and the movie capture mode has conveniently been moved to its own spot on the mode dial, rather than tied to live view. So with the T1i, you get a sizable chunk of the more expensive 50D's imaging performance plus an arguably better spec-wise video capture mode than the D90—a pretty sweet deal here at an entry-level price. We don't want to get too gushy without giving this camera a serious real-world run-through, but as of now, the only major negative we can see is the ridiculous name. T1i? What? Why Canon USA doesn't use its handy three-digit designation for the entry-level Rebels like it does in Europe (where the T1i is known as the 500D, matching with two-digits for the mid-range and single-digits for the pros) I will never know. I think Andre Agassi is to blame. Look for more on this puppy when we've had a chance to really sink our teeth in. LAKE SUCCESS, N.Y., March 25, 2009 - Canon U.S.A., Inc., a leader in digital imaging, today introduced a new addition to its Rebel lineup, the EOS Rebel T1i Digital SLR camera, the first in the Rebel line to feature Full HD video capture. The new Canon Rebel T1i SLR incorporates some of the best technologies from the EOS 50D and EOS 5D Mark II models into an entry-level juggernaut. With a 15.1 megapixel CMOS sensor and HD video capture, along with the DIGIC 4 Imaging Processor, the Rebel T1i gives aspiring photographers plenty of reason to step-up to the latest and greatest model in the Rebel lineup. The new Canon EOS Rebel T1i raises the entry-level bar with a host of enhanced Canon technologies now available in an entry-level DSLR. Along with the boost in megapixels and Canon's most advanced imaging processor to-date, this latest Rebel camera has also been enhanced with HD video capture, a 3.0-inch Clear View LCD (920,000 dots/VGA) monitor and user-friendly functions such as Auto Lighting Optimizer, Creative Auto Mode and Canon's Live View modes, all the right tools to open new doors for imaging enthusiasts. From high-resolution to high-definition, the new EOS Rebel T1i Digital SLR camera helps to give creative consumers a jumpstart on the next evolution in digital imaging. "We are witnessing the emergence of a new phase in digital imaging history, as high-resolution still images and HD video can now both be produced in a hand-held device, for under $1,000. This is truly a great time to be involved in digital imaging as the advent of online communities are helping usher in this next great era in imaging," stated Yuichi Ishizuka, senior vice president and general manager, Consumer Imaging Group, Canon U.S.A. The muscle behind Canon's new EOS Rebel T1i camera is the DIGIC 4 Imaging Processor with 14-bit analog-to-digital conversion and the ability to process full HD video. The Canon EOS Rebel T1i Digital SLR offers continuous shooting at 3.4 fps for up to 170 large/fine JPEG images or up to nine RAW images in a single burst when using a class 6 or higher SD or SDHC memory card. Whether capturing wildlife on the run or a child mid-stride on the soccer field, users will appreciate the fast shooting capabilities of the Rebel T1i Digital SLR camera. With the combination of its 15.1-megapixel APS-C size CMOS image sensor and the powerful new DIGIC 4 image processor, the Canon EOS Rebel T1i camera provides ISO speeds from ISO 100 up to ISO 3200 in whole stop increments, along with two additional high-speed ISO settings - H1: 6400 and H2: 12800. The EOS Rebel T1i Digital SLR utilizes a precise nine-point Autofocus (AF) system and AF sensor for enhanced subject detection. The new EOS Rebel T1i DSLR provides a cross-type AF measurement at the centre that is effective with all EF and EF-S lenses, while providing enhanced precision with lenses having maximum apertures of f/2.8 or faster. The cross-type AF measurement reads a wider variety of subject matter than conventional single-axis AF sensors and thus increases the new camera's ability to autofocus quickly and accurately when shooting still images. The EOS Rebel T1i camera is compatible with Canon's complete line of over 60 Canon EF and EF-S lenses, to help provide an incredible variety of visual effects to both still and video imaging capture, including ultra-wide-angle and fish-eye to macro and super-telephoto. This includes all of Canon's large-aperture EF L-series professional lenses. 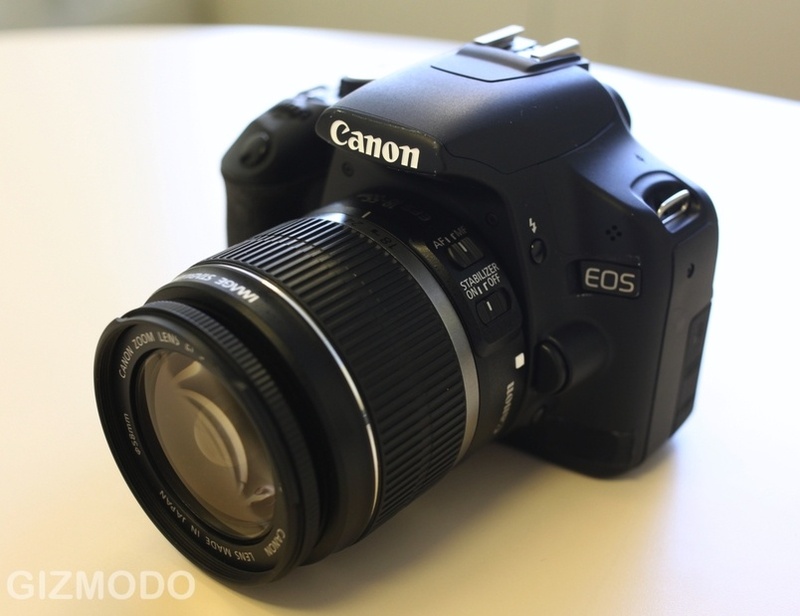 After the introduction of the EOS 5D Mark II in September 2008, the Company's first HD video DSLR, Canon has integrated this must-have feature into the new entry-level flagship EOS Rebel T1i camera. The camera features 16:9 720p HD video capture at 30 fps as well as a Full HD 1080p video capture at 20 fps, and a third option to record 4:3 standard TV quality (SD) video capture at 640 x 480 pixels and 30 fps. The video capture mode is part of the camera's Live View function, using the Picture Style that has been set for Live View still image shooting. The camera allows skilled photographers and enthusiasts to adjust image sharpness, contrast, colour saturation and white balance, and have those settings apply to the movie image as well. When recording video, the camera's rear LCD screen is letter-boxed by a semi-transparent border to match the aspect ratio of the movie recording size. Like the EOS 5D Mark II model, the EOS Rebel T1i camera will record video up to 4GB per clip equaling approximately 12 minutes of Full HD video, 18 minutes of 720p HD video, or 24 minutes of SD video depending on the level of detail in the scene. Video clips are recorded in .MOV format using an MPEG-4 video compression and sound is recorded using linear PCM without compression. The camera features a built-in monaural microphone to record sound. To help show off those fantastic movies as well as still photos, the EOS Rebel T1i camera includes an HDMI (High-Definition Multimedia Interface) output to display crisp, clear images on a High-Definition TV. 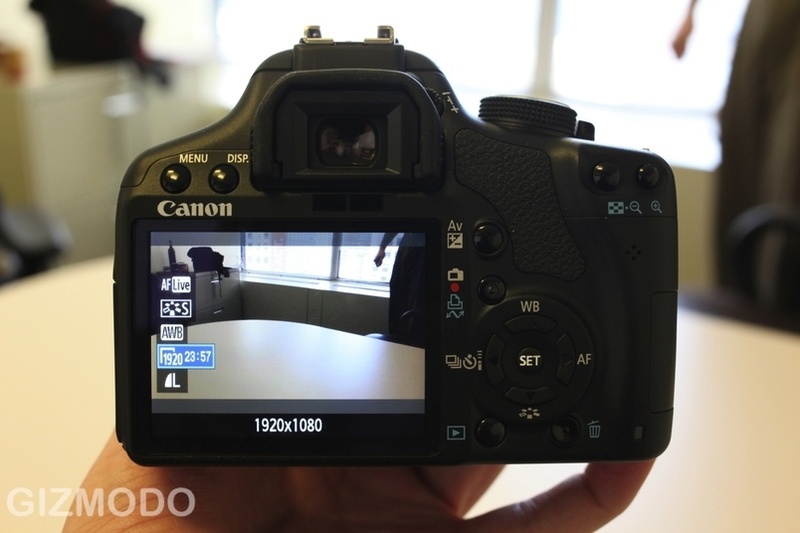 Much like the EOS 5D Mark II, the Canon EOS Rebel T1i camera features Live View for both still images as well as video. The Rebel T1i features the Company's three Live View AF modes - Quick, Live and Face Detection Live mode - which can be used to capture still photos or video images. Quick mode automatically sets One-Shot AF using the camera's phase detection AF system. It also allows users to select the AF point, even while the Live View image is displayed. Although the camera's reflex mirror must be lowered briefly to take an AF measurement in Quick mode, it is the fastest way to set focus automatically when the Rebel T1i camera is set for Live View. Live mode uses contrast-detection AF with the image sensor and here, as with Quick mode, users can change the location of the active AF point using the Multi-controller. Face Detection Live mode uses contrast AF to recognise human faces. When multiple faces are detected, the largest face closest to the centre of the frame is targeted as the AF point. While Live View is engaged, users can still change settings including the AF mode (Quick, Live, Face Detection Live mode), drive mode, ISO speed, Picture style, White Balance and more. Canon's Auto Lighting Optimizer technology helps ensure that the subject of each picture is clearly visible by analysing image brightness and automatically adjusting dark areas in images so they appear brighter. This is ideal when shooting high-contrast situations that include harsh shadow areas, such as landscape images where the foreground is brightly lit and the background detail blanketed in dark shadow. In a scene such as this, the EOS Rebel T1i camera's Auto Lighting Optimizer technology maintains exposure of the highlight areas while lightening shadow areas for a more enjoyable and evenly illuminated image. The EOS Rebel T1i also supports Peripheral Illumination Correction for up to 40 Canon EF and EF-S lenses. Canon's "CA" Creative Full Auto setting available on the EOS Rebel T1i, EOS 50D and EOS 5D Mark II cameras allows users to make image adjustments such as exposure compensation, aperture or shutter speed through a simple navigation screen on the camera's LCD screen, allowing them to "blur the background" or "lighten or darken the image" with ease. These easy-to-understand image options allow learning-photographers to experiment with image options while still shooting in an automatic mode. The Canon EOS Rebel T1i Digital SLR Camera is scheduled for delivery by early May and will be sold in a body-only configuration which includes a rechargeable battery pack and charger, USB and video cables, a neckstrap, an EOS Solutions Disk CD and a 1-year Canon U.S.A., Inc. limited warranty at an estimated retail price of $799.99 . It will additionally be offered in a kit version with Canon's EF-S18-55mm f/3.5-5.6 IS zoom lens at an estimated retail price of $899.99 .